Say goodbye to the Bramble Cay melomys, a small rat-like creature that lived on a tiny island near the north coast of Australia. Significantly, it marks the first time that a mammal has been declared extinct anywhere in the world, and the cause has been attributed to human-induced climate change. 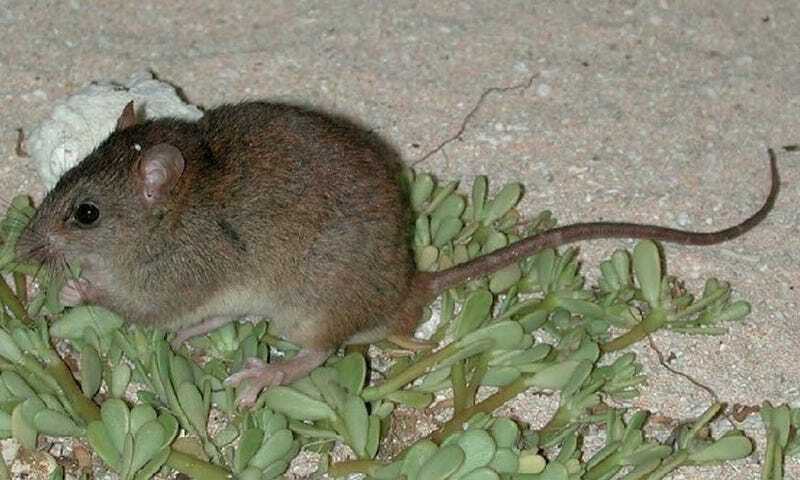 In a new report co-authored by researchers from Queensland’s Department of Environmental Protection and the University of Queensland, the “root cause” of the melomys extinction was sea-level rise. But the real culprit here is anthropogenic global warming. These creatures, which used to number in the thousands, lived on the island of Bramble Cay, which measures a mere 1,115 feet (340 m) across and 300 feet (150 m) wide. This Torres Strait island sits just 10 feet (3 m) above sea level at its highest point, making it exceptionally vulnerable to severe weather and rising waters. The scientists said that the island has been inundated with water on multiple occasions, killing the Bramble Cay melomys and destroying their habitat. Birds on the island have also been affected. In their ensuing report, Ian Gynther, Natalie Walker, and Luke Leung didn’t mince words about the cause. Over a period of 10 years, the melomys lost 97 percent of their habitat, with vegetation declining from 2.2 hectares in 2004 to just 0.065 hectares in 2014. Globally, average sea levels have risen by almost (7.8 inches) 20 cm, but sea levels around the Torres Strait have risen at almost twice this rate. Sadly, experts say this is just the beginning. We are now in the early stages of a mass extinction. A recent report found that a sixth of the world’s species face extinction due to climate change. The next mammal to go could be the white lemuroid ringtail possum. Back in 2005, this fragile creature, which is endemic to a single Australian mountain range, was nearly wiped out by a heat wave. As these severe weather events increase, and as habitats continue to dwindle, we can expect more of this.